This week has completely flown by. I haven't had the chance to pick up my camera once until today. It is starting to be my melody; the shot of the week taken on the very last day of said week. LOL, at least I am getting one, right? I want to share with you something that made my heart melt. Right before we were leaving for Milan last Friday this card arrived for me in the mail. My little goddaughter made it for me and had her mum or dad send it in the mail. 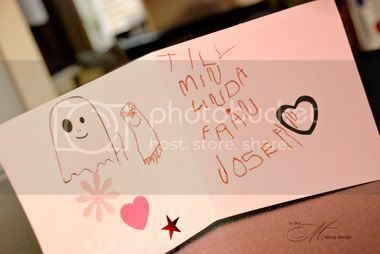 Inside it says "For my Linda from Josefin" and she has drawn in it too. Isn't it just the sweetest thing you have ever seen? It had me crying buckets. She is such a sweet little girl. I love her so! 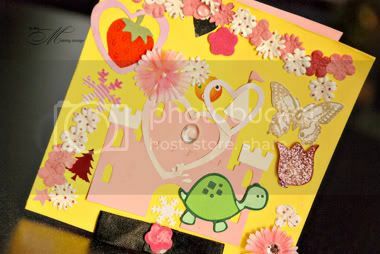 I love your Goddaughters card... especially her drawings inside! How cute. :) Little surprises like that are so precious ... they grow so fast so you have to enjoy it now! My Godson is now 16, and it only seems like yesterday he was drawing me cute little pictures too! Check me out - I'm sporting a freebie!